PULLMAN, Wash. (AP) — Chris Petersen walked away from the party happening in the end zone where the Apple Cup was being passed around by his players for the sixth straight year. He reached down and grabbed a chunk of the snow that blanketed the turf of Martin Stadium and fired back at the snowballs being flung his way from his two sons. 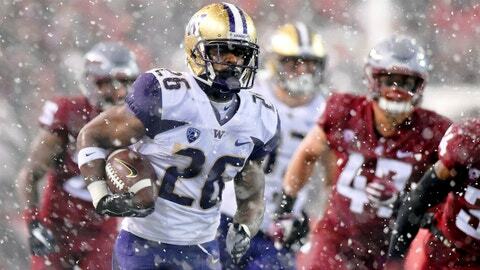 There was plenty of celebrating by Washington‘s coach and his players — snow angels, snowball fights — after the Huskies continued their dominance over Washington State in an Apple Cup the purple and gold won’t soon forget. Washington State: The Cougars have struggled with Washington’s pass defense in recent years and the slick conditions made it even more challenging. No Washington State wide receiver had more than four catches. The Washington band did not perform, a day after one of its three charter buses rolled onto its side while traveling from Seattle. The Washington State band performed the Washington fight song “Bow Down to Washington” during a pregame performance on the field. The section of Martin Stadium where the Washington band would have sat was roped off and left empty. The bus crashed Thursday evening on an icy stretch of Interstate 90 in central Washington. Of the 56 people on board, 47 were taken to hospitals for evaluation or treatment.